I’m sure we all once found ourselves in the following situation: we are spending some time on the internet, searching for a topic of our interest, reading great articles and trying to find a solution to help us on our everyday tasks at home or at our work. Then we come across different services and applications that will make our lives easier. It’s the productivity app for our smartphone, a service that promises a better way to manage our daily tasks and SaaS that we’ll take our business on a trip to “Growth Land”. I know that many tools have onboarding for new sign ups in place but it’s not that easy to make users that are trying a new application (specially free trials) really use it. Been there, done that. Totango, on a report released in 2012 “SaaS Conversion Benchmark” has one slide to talk about the “Anatomy of a free trial” that brings the following statistics: 70% of people that subscribe for a free trial are “accidental signups”, meaning that they don’t do anything on the application after signing up. This might be true for everyone or only for those Totango interviewed but I’m sure that if you work for a company with a SaaS, you’ll relate to these numbers. Engaging users and retaining them is a challenge we face everyday. Is a never ending wheel where we have always to be testing and trying to improve every single point of contact of our users with Route. All Marketing Automation platforms will tell you they’re easy to use. If you have technical skills and know at least basic things about how to work with code this first step is a piece of cake. You might be asking yourself: why do I have to paste Route’s main script on my site? With this snippet you’ll be able to start tracking users as soon as they access your site. Otherwise you won’t be able to target users based on what they do or don’t do on your website. Think about this: you probably already put (or asked someone you know) Google Analytics tracking code on your site, why don’t putting Route’s main script there too? Installing our main script is really important if you want to get all the benefits of our tool (and if you’re familiar with other applications that have some kind of tracking you know that they ask you to do the same thing). You can also add contacts manually but we don’t think this will be the main way you’ll populate Route with contacts. For a quick set up I would suggest you to import a list of contacts you already have so you can send a campaign to the leads you already own and map forms of your website to start collecting new leads right into Route. If you don’t have embeded html forms on your site we offer integrations with some landing page services and form builders. People tend to look at Marketing Automation plaforms (MAPs) and think about “automating emails”. Although email has a key role in all MAPs, there are other things you can automate with Route. And that’s a great thing! You can automate other tasks like alerting your team when something important happen using our integration with Zapier to send information about contacts to other applications like Slack and HipChat for example. You can send contacts to CRMs other than Pipedrive (which we have a custom integration with). Soon you’ll be able to send SMS, send contact details to build your Facebook Ads custom audiences and much more. We are all used to email marketing softwares that work with lists. You add people to lists and you send emails. With Route you have to think that you have one huge list of people that is dynamic. People can enter and leave different list depending on their behavior and characteristics over time. Right now I know you are thinking this: “But, Felipe! You just told us that we can import a csv list of emails? Why should I stop thinking about static lists?”. Because importing a file with emails can be something important to start using Route, to send your first campaign, to target leads you collect offline, but it’s not the central part of Route. We believe your best results will come from sending messages based on behavior and characteristics and this you’ll fully accomplish with the mindset of a dynamic list. But we also decided to offer an easy way to track events without having to work with code. With Route you can choose our Visual Mode to track events with no more than a couple of clicks. We decided to add this feature because we think that if the power of a Marketing Automation platform relies on data to create the best campaigns, we had to make an easy way to let people collect this data. So, if your not a technical person go ahead and track events like a boss! You can set the best triggers to start an automation. You can spend days checking your data and trying to understand how your users behave. You can dig in your leads profiles to see who they are. Nothing will help you with you don’t put a lot of effort to create the best possible message. Think about the message, send it, test it, improve it. You’ll hardly reach a point where you think “it’s all perfect now”! Analyzing how your emails are performing and checking if they are helping your business to reach the goals you set is an important task to be successful using a Marketing Automation platform. Don’t think it’s “just an email”. It’s the moment of truth. It’s the time you’ll try to make your leads listen to what you are saying! Every Marketing Automation vendor says in one way or another that they are easy to use. Although other companies like to say they are easy to use and implement I think only Route took it to the next level. But first, what means “easy to use”? Some believe they are easy because they are simple. They don’t have thousands of features that would make their software hard to understand. They offer simple automated campaigns. They let you create forms right from their platform (well, this is actually pretty good and Route soon will offer this). Some believe they are easy just because they can’t say they are complex. Some companies say they are easy to use but you must pay for their consultancy to implement and start using. Go figure. With all of those things in mind we wanted to create an easy to use Marketing Automation that is actually easy. That’s why we offer a lot of integrations with other applications. That’s why we developed a feature to track events with a simple point and click. That’s why we help you map your own forms automatically and that’s why our next step is to allow you to create new forms that capture contacts directly into Route! I’ve tested and studied our competition. I’m pretty confident that Route is the only one you can set up and send your first campaign in less than 10 minutes (we believe you could do it in less than 5). USING ALL OF OUR FEATURES! This is important because tracking events, for example, would require a developer to sit down and write some code. Adding this to the mix would make it quite impossible to send a campaign in less than 10 minutes. 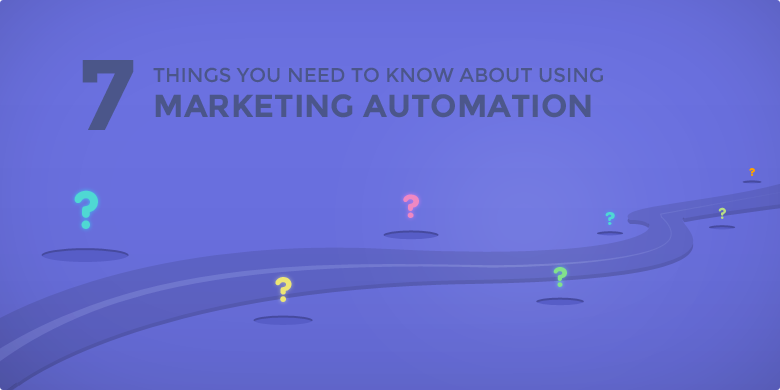 I’ve listed 7 things you need to know about using Marketing Automation and about using Route. Now is your turn to find out if you agree with me. How? If you don’t have an account yet go ahead and create your account. If you are one of our testers or client, access your account and become a Marketing Automation expert.